Most evergreen trees and shrubs require little to no pruning. However, when the need arises, such as for a spring shrubbery shape-up or when a tree is blocking a walkway, timing is important. Dead, diseased or broken wood can be removed from an evergreen at any time of year, but corrective pruning should be completed only at specific times of the year. Spring is the recommended time to prune evergreen shrubs to tidy up their appearance, according to the University of Iowa Extension Office. Prune in late March or early April before the flush of new growth appears. Perform a second, light trimming in late June or early July. Pruning at these times is good for shrubs. It stimulates new growth, controls size and shape, enhances appearance, improves disease resistance and removes damaged foliage. Don't prune them in fall, as this makes them more susceptible to winter damage. Evergreen trees are on a different timetable for pruning. The University of Iowa Extension recommends pruning evergreens such as spruce and fir in late winter, when they are dormant. Remove any unsightly lower branches at this time. Prune pine trees in early June to early July by removing the top one-half to two-thirds of the ''candles'' at the edge of the branches. Careful pruning won't harm an evergreen tree, but it is usually not necessary. Choose an evergreen tree or shrub based on its mature size, not its size when planted. If a tree or shrub requires frequent pruning to keep it from growing over a sidewalk, driveway, roof or porch, consider replacing it with a smaller specimen. Keep an evergreen tree 10 feet from any structure such as a house, walkway or power line. If it grows any closer, prune it back during winter dormancy or in early spring before new growth begins. 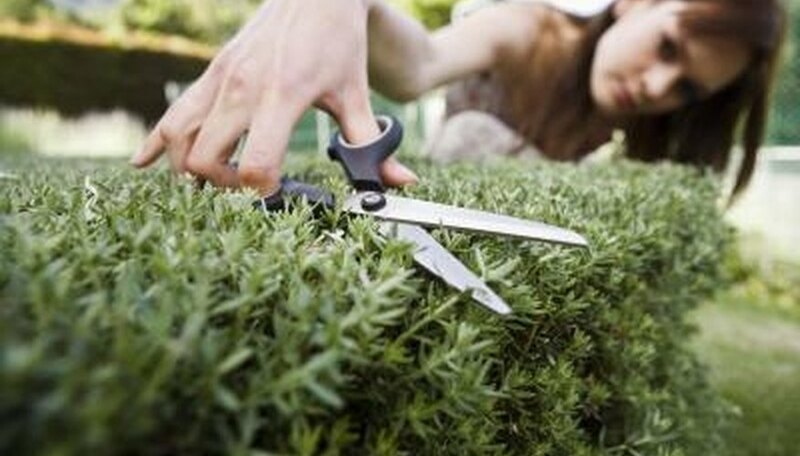 Always try to retain an evergreen's natural form when pruning. Shape hedges so they're narrower at the top and wider at the bottom, allowing the sun to reach the lower foliage. If the shrub is narrower at the bottom, the top portion shades the lower portion and harms its growth. When pruning a needled evergreen, never cut past the green wood. The green wood produces the new growth. Frequently step back from the tree or shrub you are pruning and observe your progress. Texas Agrilife Extension Texas A&M System; Follow Proper Pruning ...; Douglas F. Welsh, et al.